•	2 oz. Caramel Corn - Super crunchy and super delicious, one of our most popular popcorn recipes. •	1 oz. White Cheddar Popcorn – Plump kernels with delicate white cheddar goodness and just a hint of buttermilk. •	1 oz. White Gourmet Pretzel – Individually wrapped pretzels covered in a sweet confectioners’ coating. •	2 oz. Sour Stars – Star-shaped, sour, chewy candies in assorted fruit flavors, a puckerlicious treat. •	2 oz. Sour Hard Candies – Individually foil-wrapped, sour balls in assorted fruit flavors. •	1.075 oz. Chocolate Chunk Cookie – Soft baked, chewy and delicious cookie loaded with chunks of milk chocolate. 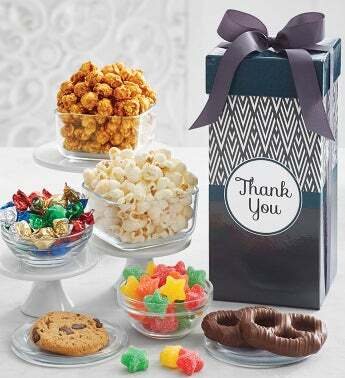 With an elegant design, charming presentation and an array of gourmet treats, our new Simply Stated Thank You design Tall Snack Box is a terrific way to show your appreciation. It comes filled with two flavors of popcorn magic and mix of tasty treats.